KUALA LUMPUR, Malaysia, 18 October 2018 – Ford recently celebrated the production of its 10 millionth Mustang – America’s best-selling sports car of the last 50 years and the world’s best-selling sports car three years straight. Ford started exporting the Mustang officially in 2015, and today, Mustang is available in 140 countries across the globe, including key markets in Asia Pacific such as China, Australia, India and The Philippines. More than just a sports car, Mustang is a cultural icon, with owners and fans gathering in Mustang car clubs all throughout the region. Mustang clubs can be found in countries as diverse as Taiwan, Malaysia and New Zealand. All 5.0-liter V8 2019 Mustangs with manual transmissions offer rev-matching downshifts come to the six-speed Mustang GT, while EcoBoost® gets an optional quad-tip fully active exhaust. All-new custom-tuned 1,000-watt B&O PLAY high-performance sound system and available Apple CarPlay™ compatibility for Ford+Alexa and Waze via SYNC® 3 will satisfy audiophiles. All-new sixth generation Mustang, first with independent rear suspension and Shelby GT350 / GT350R with flat-plane crank 5.2-liter V8. Mustang officially goes on sale in export markets in Asia-Pacific for the first time. 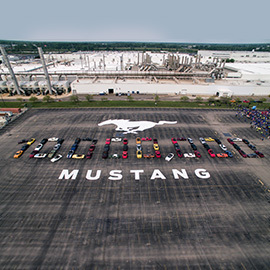 Dearborn Assembly Plant ends 40 years of Mustang production moves to Flat Rock Assembly Plant in Flat Rock, Mich.